The worst place I ever got poison ivy was in my belly button. At that time, I had one of the worst cases of poison ivy that I had ever experienced. Angry red rashes that resembled chemical burns were plastered all over my body, but the little rash inside my belly button was the worst. When I got hot or moved the wrong way, the folds of my belly button rubbed together exacerbating the awful burning itch exponentially. The amazing thing was that I hadn’t come into contact with any poison ivy, poison oak, or poison sumac plants for the previous few days. My husband and I had been on a camping/canoeing trip, and I had been very careful not to expose myself to the plants. Unlike me, my husband does not get poison ivy, oak, or sumac. He can roll in it and not get so much as a bump. So when we came to our riverside campsite and found that the tree under which we wanted to pitch our tent was covered with an old, dead, fuzzy-looking poison ivy vine, I told my husband we’d have to find another site. My husband liked the seclusion of the spot and so went to work ripping the old vine down with his bare hands and tossing it far into the woods beyond. I watched from a safe distance. Now that the threat of the plant was gone, neither of us thought anymore about it. As far as we were concerned, the matter was taken care of, I was safe, and we worked together setting up our campsite. The trip was wonderful, but two days later, I was in utter agony. So how did I end up with such a bad case of contact dermatitis from a plant I didn’t even touch? My husband gave it to me. In order to understand how, you need to understand the nature of the poisonous triplets: poison ivy, poison oak, and poison sumac. These three plants all contain a resin known as urushiol [oo-roo-shee-awl]. This oil is the culprit that causes the angry, red rashes. Anytime this oil comes in contact with the skin, it will attach itself to the outer layer of skin cells and to the layer of live cells below. In approximately 85% of people, this will cause an allergic reaction. The degree of your rash will depend on your sensitivity. 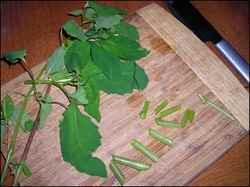 Urushiol is just as potent outside of the plant as it is inside the poisonous triplets. So you do not have to come in direct contact with any plants. If you touch an object that has urushiol on it, it will still cause contact dermatitis. That is how my husband gave it to me. Once he touched the vine he had urushiol on his hands. Everything he touched from there became contaminated, until he washed his hands. The camp ax, our towels, our life vests, the camping gear, the cooking utensils were all compromised. If he touched something, handed it to me, and I grabbed the area that he touched, my hands were contaminated. Once my hands were contaminated, every time I touched a part of my body, I got urushiol on it. The tricky thing about urushiol is that the same patch of oil can reinfect you time and time again. So if you were weed eating and urushiol got sprayed on your shoelaces from hitting a poison ivy plant, it can get on your hands every time you tie your shoes. Last year’s garden gloves, with which you pulled weeds, could still be contaminated. Pets that run through plants can get the oil on their coats. Contaminated clothing can transfer the oil to furniture. It is possible for urushiol to remain active on surfaces for years. Until contaminated items, or pets, are washed, they can infect a sensitive person. Once the oil touches you it can take between 12 to 48 hours for a rash to develop. The length of time it takes for the rash to appear varies depending on the sensitivity of your skin. Rashes resulting from the same incident of contact may take different lengths of time to develop. For example, if your hand comes in contact with urushiol, and then you touch your face, the rash on your face may develop two days before the one on your hand will. This is because the skin on your hands tends to be thicker, and therefore less sensitive, than the skin on your face. The characteristics of urushiol have given rise to a few poison-ivy, -oak, and -sumac myths. Myth # 1: Poison ivy, poison oak, and poison sumac rashes are contagious from person to person or from one spot of your body to another. If you touch the rash in one part of your body it will transfer to another part of your body. Myth #2: Poison ivy, oak, and sumac can travel through your blood stream to produce new rashes. Myth #3: Popping the blisters on a rash will release more urushiol that will spread the rash. Poison ivy is spread through the dissemination of the urushiol resin. Wherever the resin has touched a sensitive person’s body, the rash will spring up. Because there can be a delay of 12 to 48 hours, it can seem as if a person is doing something to cause it to spread even after it has been washed off the skin. Blisters are the body’s reaction to the oil and do not contain urushiol. Myth #4: Drinking poison ivy tea or eating it will make me immune. Consuming any of the poisonous triplets will only give you some very nasty gastrointestinal problems and could cause death in some cases. These plants are not safe for human consumption. Myth #5: I can’t touch the leaves of poison ivy, but I can touch the stem. Myth #6: Poison ivy is safe to touch in the winter. All parts of the poisonous triplets contain urushiol, so, if you are allergic, neither the leaves, the stems, or the roots are safe for you to touch with bare skin. The poisonous triplets contain their highest amounts of urushiol in the spring and summer. Wintertime may lessen the amount of urushiol in their surviving plant parts, but it is still there, capable of giving contact dermatitis even in the coldest temperatures. Not even dead plants are safe to touch. Once you come in contact with the oil, most people usually have a window of opportunity to wash it off before they become affected. Opinions vary on the length of this window, but the shortest one is about ten minutes. If you know you have come in contact with one of the poisonous triplets, wash the area as soon as you can. There are many suggested methods of washing urushiol off your skin. Using soap, dishwashing detergent, rubbing alcohol, vinegar, commercial cleansers, and mineral spirits are all possibilities that can aid in removing the offending resin. Washing with hot water will open skin pores and possibly allow the urushiol to penetrate deeper so use cool water instead. The most important thing is that you get the oil off your skin without spreading it to other parts of your body. But what about those times when you are out in the woods, ten miles away from the nearest sink, and you don’t have any rubbing alcohol, mineral spirits, or even soap with you? If all you have is a water bottle, you can get some of the urushiol off with that. It may not be 100 % effective, but it will help. Recalling folk remedies of using mud to draw poisons from a body, I personally have used it and puddle or creek water to get the oil off when I had nothing else. It was effective. I just gently smoothed soft watery mud over the affected area and then rinsed it off. I would avoid hard rubbing or using sand as this might create scratches in your skin, therefore making it more welcoming for the urushiol to soak in. If you have a rash, despite your efforts to avoid the plants and the urushiol, many methods exist for you to choose from to alleviate your pain. There are many over-the-counter washes that can aid in treating and soothing your rash. In most pharmacies, they even have their own section. Just ask your pharmacist where they are. If you have any drug allergies, double check with your pharmacist to make sure it is ok for you to use the product. When you live far away from a pharmacy, or when a rash springs up during an inconvenient time, a home remedy may help. If you prefer a home remedy you can see which of these suits you: salt, vinegar, rubbing alcohol, vodka, oil of oregano, osha-root tincture, a baking soda paste, aloe vera, soaking in oats, witch hazel, or tea tree oil. Methods of application for all of these are easily found on the Internet. As with most home remedies, trial and error will help you determine what is most effective for you. All of those may be fairly well-known, but there are two Appalachian folk-remedies that may be of interest: coffee and jewelweed. Washing the poison ivy rash with cold, plain, black coffee is one old remedy. The interesting thing to note is that an anti-inflammatory, chlorogenic acid, is contained in the coffee bean. Although not proven by scientific studies, some people have found relief from it. Jewelweed is another remedy that is a personal favorite of mine. Jewelweed grows in abundance in our area. We find it around the moist, shady banks of creeks and streams. Also known as the “Touch Me Not”, this plant produces yellow to orange flowers with red spots that look like pendants, or slippers. If you do not know this plant, it is well worth getting acquainted with. According to the Peterson’s Field Guide for Medicinal Plants and Herbs, a 1957 study found that out of 115 people treated, 108 found it effective. This plant contains a compound called lawsone in its leaves. Lawsone is an anti-inflammatory and an antihistamine. Some people drink the leaf-tea as a preventative for poison ivy. 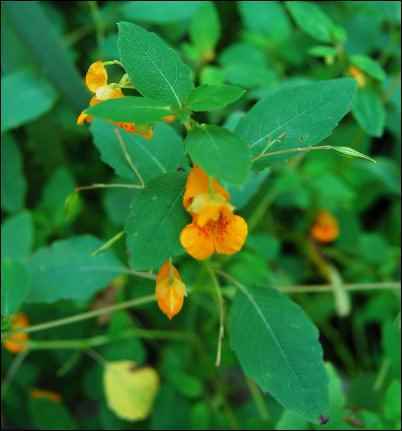 Although I cannot attest to jewelweed tea’s efficacy in rash prevention, I can say my family and I have found jewelweed very effective in soothing that horrid, burning itch. Because the plant is not available year round, but poison-ivy rashes are, I have made a salve from jewelweed that has proven very useful. I made this particular batch at least two years ago, and according to my son, it was still effective this very morning. Gently simmer the chopped stalks of jewelweed in the oil for approximately five to ten minutes. Strain the mixture through a coffee filter or clean cloth. Put mixture in clean, empty baby food jar or 1/2 cup mason jar. Place mason jar in a pot or pan of water, making double-boiler or water bath. Add contents of two capsules of vitamin E (poke the capsule with a sharp knife or needle and squeeze into the jar.) Stir to mix. Grate beeswax and place in jar. Test consistency by taking a small amount out on a spoon and letting it cool. If the consistency is too runny for your tastes simply add more beeswax. I left my concoction a bit runny. When in the refrigerator, it is rather hard and I often use a fork to help me separate a chunk for use. Once in my hands, it begins to melt and I rub it straight onto the rash. Although the vitamin E helps to preserve the salve, like anything in your refrigerator, it can turn moldy over time, so inspect it before each use. If you do not have the ingredients to make the entire salve, I have found sources that said some people found relief by making a tea and freezing it into ice cubes. Rub an ice cube over the rash to help soothe the rash. Prevention offers the best protection to those of us who are sensitive urushiol. Getting rid of plants in areas of your yard where you or your pets can come in contact with it is important. There are several commercial herbicides that will take care of offending plants. However, for those of us that do not want to use them, there are a few other options. One method is to find someone like my husband and have them rip out the whole plant, roots and all. If you have to try to do it yourself, wear thick disposable gloves. Put the ripped up plants in a trash bag; be very careful handling the trash bag after you put the plants in them. Remember that once you touch the plant, you’ve got urushiol on you. If you then touch the trash bag, it will have urushiol on it. Even though it may be very tempting, do not burn the plants. Doing so can cause the urushiol to become airborne. Inhaling it can cause serious respiratory tract problems and even death. Another method of getting rid of the poisonous triplets is to employ a goat. There are many animals that are not affected by eating poison ivy, poison oak, or poison sumac. That could be the one saving grace of these plants: they feed wildlife, such as deer that graze on the leaves and birds that eat the berries. My misadventures with poison ivy have guided me to learn more about urushiol and how it works. The knowledge leaves me forearmed. Although I would like to live a life free from worry of the poisonous triplets, I know I can’t. I won’t always be able to control who touches what and when they touch it. However, now I feel confident that I can deal well with the wicked three (and their hell-spawned urushiol), and teach my family to do the same.